The IBA Australia Shop, offering items unique to IBA Australia, has been released - see here: http://www.ibaaustralia.com/shop/. There are only a limited number of items at present, more (eg. Caps) will be added as stock becomes available. I'm sorry, but I cannot get this out of my head every time I read a post from the Quartermaster ! Now I've got an Earworm stuck in my head! Is there a plan to stock any Aussie specific or metric patches by any chance?? 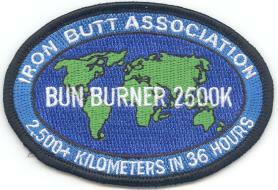 I am looking to get a 2500km/36hr type badge if it is at all possible ..... if anything like that actually exists. I am planning a ride from Melb to Townsville next week and will be looking for something to put on the jacket. Currently, when you submit your application for a ride verification there is an opportunity, as part of the cost, to have a patch sent with your package (please refer to the application at the bottom of the page here http://www.ironbutt.org/rides/ss1600k.htm ). As for stocking patches, we would like to be able to provide an opportunity to supply some IBA patches in the near future and this is currently being discussed. - There have been a number of additions to the Shop, namely Ride Flags, Number Plate Backs, and three Cloth Patches - SS1600K, BB2500K and 50CC. - Major revisions to Pricing as well, with the smaller items significantly 'better' priced. Thanks Bill! Do IBA do a number plate surround without the "world's toughest riders" on it? Quote: Do IBA do a number plate surround without the "world's toughest riders" on it? Err..... No. That's sort of the point eh? Frans is the First to order one!! The little Asian guy with a quarter of a ton, wife and kids onboard. All have a greater claim to the title "World's toughest Riders" than we do. Not trying to start an argument here, just my opinion. If the IBA ever decides to produce numberplate surrounds identifying the IBA and just a plain reference to the ride undertaken ( which they already do for the 50cc I think) I'll be the first in line. I just ordered a hat. Noticed I got the State wrong in my address; should be ACT, not NT, sorry. No probs Shane, already picked that up. I know this is an old post, but the 'WTR' line is just painted on. It can be removed with paint remover, painted over, taped over, or sliced off in a guillotine or cut off with tin-snips. Up to the individual I guess. Thanks Mick and also to Ron, who gave me a spare plate to cut up. Not everyone will agree with me on this, but when there were blokes hauling 300kilo WLA Harleys through the mud, under fire in WW2 I cannot in good conscience bear a number plate with "World's toughest riders" on it. Too be honest Rus, I actually agree with you. I don't feel I deserve that tag either, but for a different reason. I've done a few IBA rides, but not the CC or CCC or Rally stuff that possibly (probably) deserves that tag. All my rides were tough ones for me for a variety of reasons, but WTR doesn't sit well with me on a personal level. I removed my plate frame a long time ago and meant to delete that line and put it back on. Never got around to it. That's not meant as disrespect for others who wear it with pride after one or two rides, but it just seemed a bit 'loud' for me. I do wear the patch. I love the organisation and the concepts it espouses. I just find it difficult to live up to the WTR tag. Don't throw stones people. I just purchased the Aus cap and patch and they won't be dust-collectors. Proud to wear them, but in a more subtle way. I have the greatest respect for everyone who has ever completed an IBA run. After you've done a few 1600s you almost forget the planning, endurance and sheer bloody mindedness you needed to get the first one in the bank. My comments should be interpreted as the greater level of respect I have for those dispatch riders and the like rather than any negative assessment of my fellow IBA riders. Well, I sewed the new IBA Aus patch on my jacket last night and sliced off the WTR line and refitted my number plate surround. Job done. Now I need to go find a war zone and undertake an SS1600/24. Cheers team. Hi Bill, ive Looked at the Aust store and the IBA store, I don't see a SS3000 Gold, nor a few other patches for rides specific to klm distances. I think that in Aussie w should have access to a patch for rides we do here that are klm based, send to be a lot of options for mile rides yet only a couple for kilometer rides.